The supervisory control and data acquisition (SCADA) system is one of the most crucial operational technology solutions for the city gas distribution (CGD) network. The technology has been deployed by major CGD operators in India with a threefold objective of ensuring safety, reliability of service, and cost-effectiveness in the pipeline network. SCADA systems provide a large volume of data that helps pipeline controllers and operators to monitor and control CGD networks and ensure safety, reliability and cost-effectiveness. The system can be customised to have both simple and complex configurations. In a basic SCADA system, information from sensors or manual inputs are sent to the programmable logic controllers or remote terminal units that further send the information to computers. The SCADA system analyses and displays the data on a central computer, which is further used by CGD operators to enhance their operational efficiency. While some data is sent at an interval of a few seconds, the rest is provided at an interval of a few minutes or even on an hourly or daily basis. Operational data that is provided using SCADA includes information on pipeline pressure, flow rate, gas composition and equipment status. A SCADA system can be deployed at compressed natural gas (CNG) stations, city gas stations and industrial units. It can be used for the online reconciliation of billed gas and actual consumption and monitoring the losses at CNG stations. Besides, it can be used for the centralised monitoring of trends in load and performance parameters, checking the upstream pressure for each CNG compressor, continuous monitoring of gas flow parameters. It is also used for the identification of any major pockets of pressure loss across the grid. An important feature of SCADA is its ability to merge with Google Maps. In this feature, various gas stations are marked with different colours and all the adjacent geographies are marked to provide a detailed view of the area. Some of the technologies supported by SCADA are MS Windows Server 2016, MS Windows 10 LTSB, MS Visual Studio 2015, MS SQL-Server 2014 (64-bit only) and MS Office 2016 (32 bit and 64 bit). However, of all the services offered by SCADA, the OData protocol version 4.0 is likely to gain importance in the years to come. The benefits offered by OData include authentication, real-time access and maintenance of historical data. Meanwhile, the design of the SCADA system should be such that it is able to handle any kind of communication between the CGD networks. Since the controllers/sensors and other equipment used in a CGD network might be of different brands, it is imperative for the SCADA system to be able to support them. Moreover, as the number of installations, stations, meters, compressors, etc. continue to increase in the CGD network, the system should be able to handle this expansion. The SCADA system also needs to ensure compliance with standards by incorporating any new regulations/legislation changes and by meeting all safety regulations. Owing to the benefits offered by the SCADA system, it has been deployed in the country’s major CGD companies. In Mahangar Gas Limited (MGL), the implementation of geographic information system (GIS) mapping and the SCADA system has been undertaken for efficient control and monitoring of its entire CGD network. Besides, SCADA is one of the key research and development areas for the company. MGL also maintains an insurance coverage for the SCADA system. Going forward, MGL plans to expand its SCADA coverage to all city gate stations (CGSs), CNG stations, and critical sectionalising valve (SV) stations. So far, the company has successfully sustained and enhanced its SCADA system across all the four CGSs, 109 CNG stations and three SV stations. Apart from this, it plans to cover an additional 60 CNG stations and six SV stations. In Gujarat Gas Limited, the SCADA system has been integrated with GIS technology to enhance productivity. 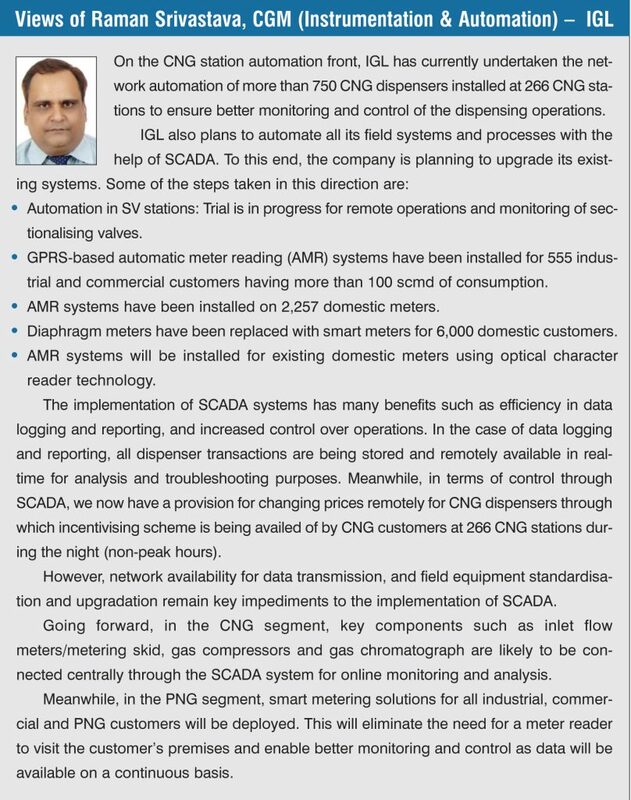 Meanwhile, Indraprastha Gas Limited (IGL) uses GIS and SCADA as one of the various methods for controlling and maintaining its huge CNG and piped natural gas (PNG) networks. Further, GAIL Gas Limited, the pioneer of CGD in India, has a SCADA system spanning four cities, enabling the centralised monitoring of the pipeline infrastructure and other assets. Gujarat State Petronet Limited has also upgraded its SCADA and telecom systems for new spur lines and adopted the latest voice over internet protocol and TCP/IPV4-based telecommunication technology. Even though there are many advantages of deploying the SCADA system in CGD networks, there are some key operational challenges that demand attention. These include inconsistent communication and signal strength, issues in the integration of older CNG stations with SCADA, inability to change prices from remote SCADA stations, challenges in disaster recovery and obsolete metering infrastructure. It is important to address these challenges to ensure the effective utilisation of SCADA in CGD networks. The business potential for CGD networks and SCADA implementation in India is significant owing to a strong domestic consumer base for the industrial, commercial and automobile segments. Further, under the Smart Cities Mission, 60 cities have been selected for development while the remaining will be taken up in round three, opening up a number of opportunities for the further deployment of SCADA as a basic component in the CGD networks. SCADA has helped generate more data in the industry. This data needs to be combined with information management tools/ systems and safety/ security solutions for more effective and efficient management, particularly of pipelines and CGD networks.